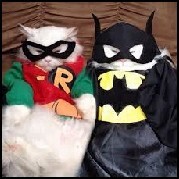 Z Cats is a unique transaction for a man living in the hills of NY with two superhero cats, (Batman & Robin ). He needs 8 replacement posts for his Go Pet Club cat tree ( 4x20.5", 3x15", and 1x17" ). This includes those posts plus shipping to the BatCat Cave. The whole deal will be stolen by their dastardly nemesis, The Joker Mouse, on 11/30/17, and will no longer be available.